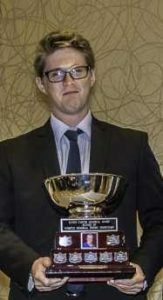 Liam Cohen, a student at Seneca College in Peterborough, Ontario, earned that title in 2017. Liam Cohen, the 2017 Webster Memorial Trophy winner. 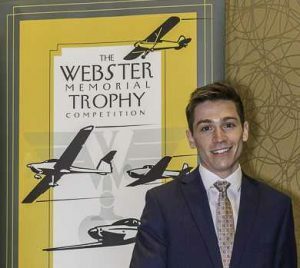 The Webster Memorial Trophy recognizes Canada’s accomplished amateur pilots. He also won the NavCanada Trophy for excellence in pilot/controller communication. Runner-up was Owen Titerle, currently flying at Coastal Pacific Aviation, Abbotsford, B.C. He received the Eunice Carter cup. * identifies individuals who received jobs with Trans Canada Airlines or Air Canada.